A new visitor passport system is bringing in more money to Michigan state parks. According to Great Lakes Echo, Michigan Recreation Passports now allow almost 2 million vehicles access to all state parks. The passports cost $10 per year and can be purchased when people renew their vehicle registrations. Under the old system, annual visitor permits were more than $20 each. But more people are purchasing the less-expensive yearly passes. In the year since the passport program took effect, it has raised almost $19 million..
That money has paid for improvements to many state parks, including repairs to water and electrical systems, bathrooms and shower facilities. The money generated under the new system is $7 million more under the previous system, in 2010. How many reptiles and amphibians live in the Saginaw Bay area? The Saginaw Basin Land Conservancy is working to conduct a broad survey of Saginaw Bay coastal habitats to document what reptiles and amphibians live there. The conservancy says that amphibians and reptiles are particulary sensitive to water contamination and habitat disturbances. The number of critters living in coastal habitats can often indicate environmental problems. In that regard, the survey is being done to evaluate the integrity of local and regional ecosystems. The results will help local and other decision-makers to determine how to best protect these animals and, if necessary, restore their habitats. So far this year, portions of more than 30 square-miles of shoreline across the bay have been surveyed, according to the conservancy. Twenty-three species were identified. 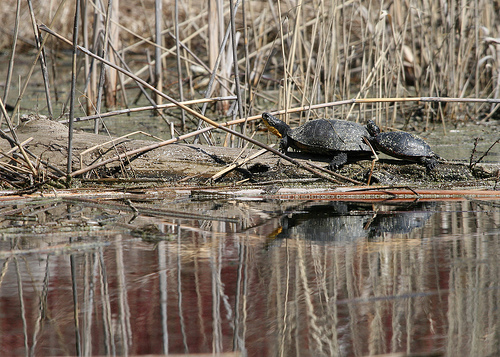 The Blanding’s Turtle, a state Species of Special Concern, was observed in several locations. Also, the rare Four-toed Salamander was documented for one of the first times in the Thumb area. The Saginaw Basin Land Conservancy project is being funded by the Michigan Department of Environmental Quality through a grant from the National Oceanic and Atmospheric Administration. There’s an informational meeting scheduled for Monday, Nov. 28, on Saginaw Bay coastal activities. The meeting will provide an update on activities from the past year, including shoreline locations of treatment projects to control phragmites, an invasive plant, in Bay and Huron counties. Also on tap is a report on beach closings and algae problems in the bay. Further details, including a location for the Nov. 28 meeting, are to be announced soon. You can check with the Bay County Environmental Affairs office, or tune in here for more information. – Photo by Matt M.